Migraines and headaches show a different pattern of expression in Twitter trends both during the week and time of day. As a migraineur, a sufferer of migraines, I was curious whether tweets on twitter would show any trends in migraine onset and whether these could be distinguished from headaches. This study uses an available searchable Twitter dataset generated by timeu.se. The results were obtained using the timeu.se data made available at the http://timeu.se/ website of Scott Golder. This allows searches of over 500M tweets from 2.4M users, collected from public Twitter accounts using the Twitter API over the course of several weeks in early 2010. 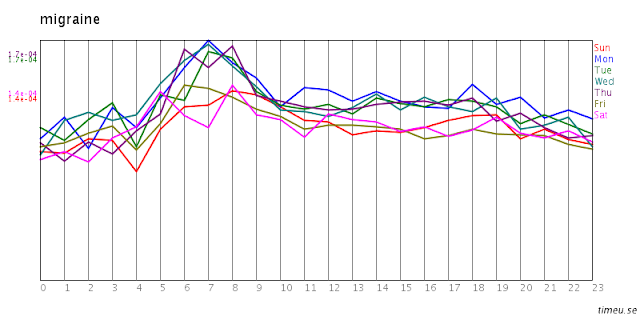 Migraine tweets show a peak in the morning at around 07:00h plus or minus 3h (figure 1). There were far more headache tweets than migraine tweets. 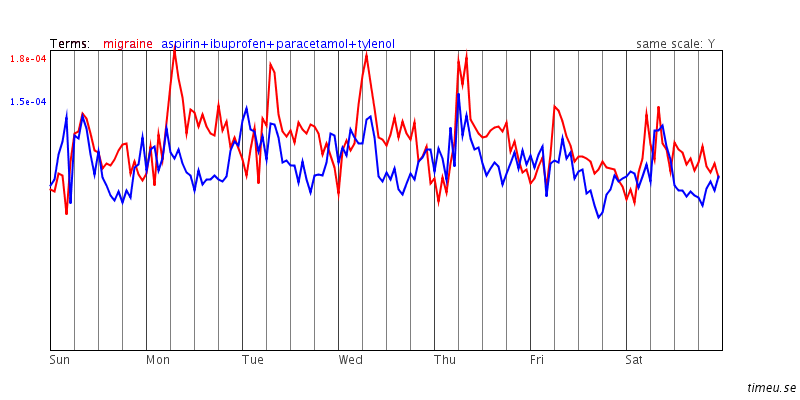 Headache tweets show two peaks during the week. 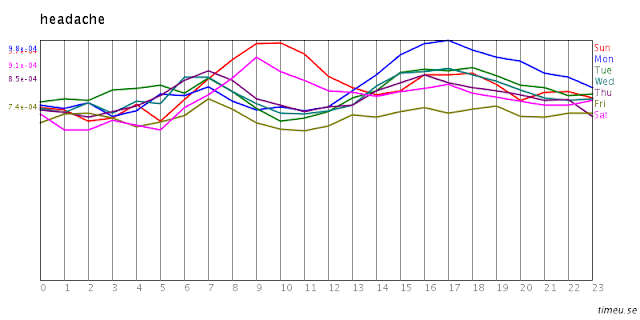 The morning peak mimicked that of the migraine peak in time (07:00h) whilst there was a broader peak at around 16:00h-17:00h (figure 2). On Saturdays and Sundays, headaches peaked strongly in the morning between 09:00h-10:00h and coincided with tweets for hangovers (Figure 3). 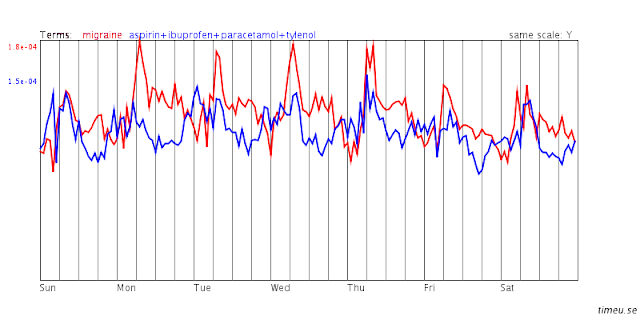 Note that the Monday afternoon headache peak was as large as the Sunday morning peak but did not coincide with hangovers. Mention of the common painkillers, aspirin, paracetamol (Tylenol in the US) and ibuprofen appeared to peak either a couple of hours before or at the same time as mentions of migraines (figure 4). Unfortunately, the common triptans used for acute migraine treatment did not trend to a sufficient degree in the database and did not appear in searches. Tweets on Twitter were able to show distinct patterns relating to mention of migraine, headaches, hangovers and painkillers. Migraines are known to occur more frequently in the morning (e.g. Fox & Davis 2003, 'Migraine Chronobiology', DOI: 10.1046/j.1526-4610.1998.3806436.x). The results here show the same phenomenon. Furthermore, Twitter migraineurs appear to be able to distinguish between a migraine and a headache as there is only a single migraine peak during the day in the total averaged data. Conversely, it appears that many headache sufferers may be unaware that their morning headache is possibly a migraine. From figure 3 it is apparent that about 5 times more headaches are mentioned than migraines. The morning minor headache peak coincides with the migraine peak. One possible conclusion is therefore that the occurrence of migraines is vastly under-reported. This may also explain the apparent and unusual closer correlation between migraines and conventional painkiller-use peaks in the morning (figure 4). Migraineurs tend to know from bitter experience that conventional painkillers do not have a significant effect on their migraines, with triptans being the saving grace for many of us. Could it be that the higher mention of the use of painkillers in the mornings is related to the fact that they do not work in many instances where tweeters are suffering from a morning headache that is actually a migraine? An alternative explanation is perhaps the surprising coincidence of peaks in the most abundant pains suffered in the morning, namely migraine. back pain and arthritis with painkiller use as shown in figure 5. 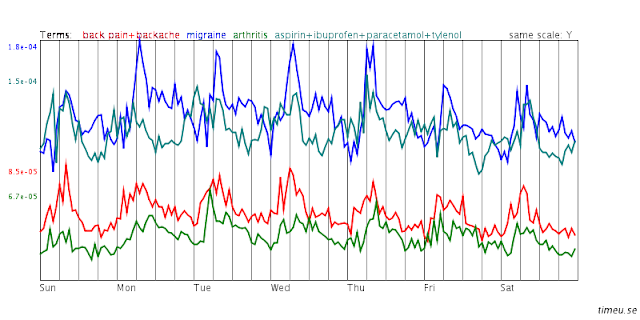 Even the restricted dataset or 500M tweets provided by timeu.se reveals interesting trends relating to the use of the term migraine in Tweets as demonstrated here. The available dataset should currently, in 2012, be significantly greater and open to further analysis by epidemiologists. 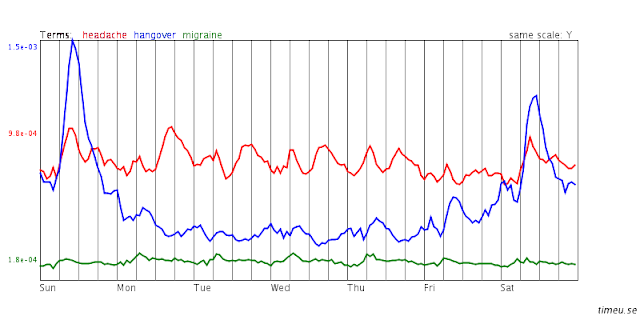 The past 24h alone had 350 tweets relating to the #migraine.